Our hallway has a funny little glass-panelled alcove beside the front door. A hat rack has lived there for some time but very recently Mrs Aussie made the observation that “a Brompton would look good there”! With me grappling with the “Brompton storage” demands of late, it seemed to be an inspired suggestion – but not for just one Brompton! Those cube-structures that you see at all the best Brompton shops would be ideal but as yet I’ve not seen anyone producing them for sale? I started thinking that I’d need to construct something so took to measuring up the space a Brompton occupies & deciding on the optimum sizing (eg not too squeezy, as some shop displays seem to be?). 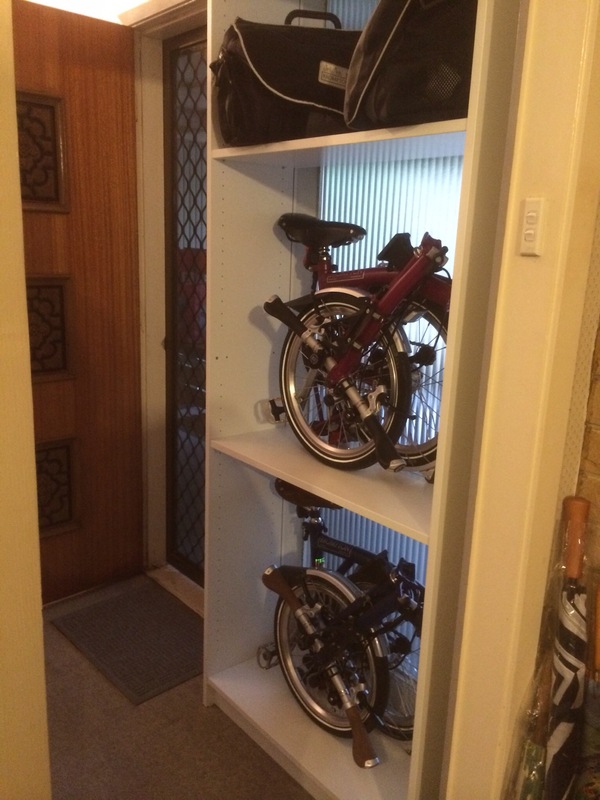 While considering design & manufacturing requirements, I noticed that our IKEA “Billy” bookcases seemed to fit the bill very well – suitable width for a Brompton & a good match to the alcove size (width & height). Billy bookcases are also exceptional value when you consider the price of the raw materials I would need & so before long I was unboxing a new unit & looking very hard at the pieces! The taller Billy design has three shelves (at top, bottom & centre) bolting to the sides & 4 relocatable shelves, as well as a back panel which gives the structure some rigidity – & keeps your books from sliding right through? I decided to re-drill the sides so that I could move the central fixed shelf down to “Brompton size” & to dispense with the back panel to allow the frosted glass alcove to do its job. An upper relocatable shelf forms a “Bag shelf” with a Brompton-size space below. Voila! – a new home for Clarence & Peregrine & 2 large luggage bags! 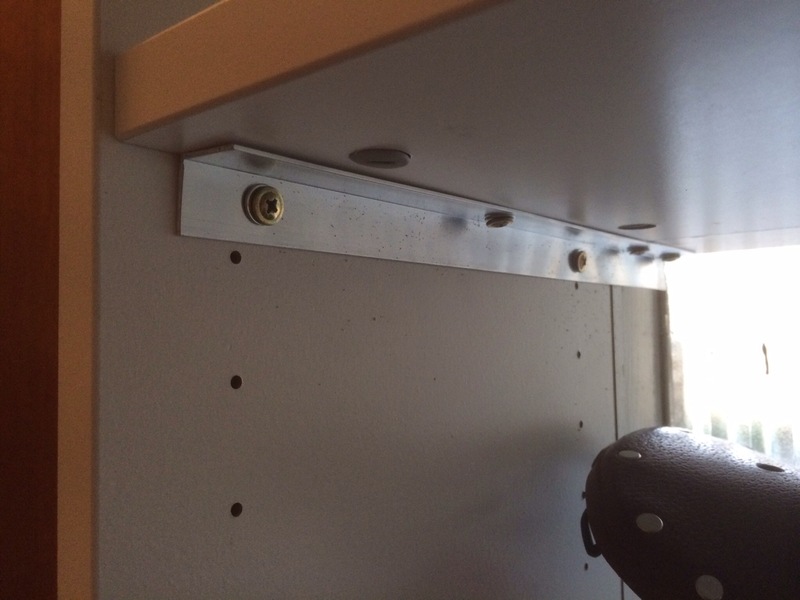 The lack of rigidity was resolved by screwing the supplied fixing strap to the top of the alcove. The one fault with the Billy bookcase however, is that the shelf-depth is not really ideal for a Brompton! 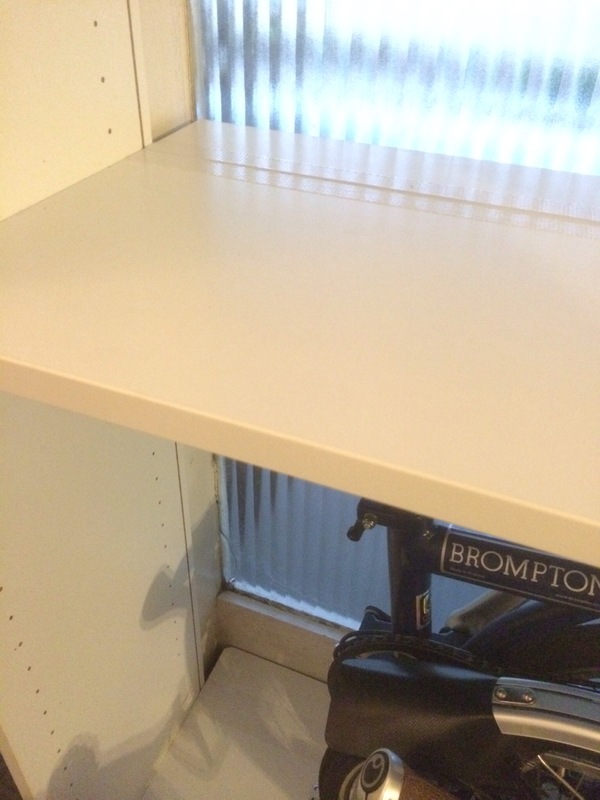 While the Brompton “base footprint” is about 50cm x 23cm, the Billy shelf is only 26cm deep, which means the folded bars protrude in front of the “Bromptoncase”. Fortunately our alcove has an extra 10cm at the rear before the glass & so I was able to slice up one of the surplus shelves & mount the pieces to the rear of the fixed shelves that the Bromptons sat on. (I used aluminium angle strips under the fixed shelf to support the new extended shelf portion – & disguised the slight gaps (my sawing quality?) with adhesive white cloth tape.) Now the Bromptons can sit further back on the shelves, contained within their Bromptoncase. im currently looking at one of these: http://www.ikea.com/au/en/catalog/products/00248379/ i can put rubys on top! they also come in a double.